Chelsea vs. Tottenham Hotspur : 24 March 2012. This game came two-thirds of the way through our very own March Madness. Nine matches, of which I would be present at all but one, two managers, Champions League games, Premiership games, Youth Cup games, F.A. Cup games and a game with Tottenham. Nobody needs to be reminded that our unbeaten home record against Tottenham goes back to February 1990. A 2-1 defeat in that game was our last reverse. This is an astounding record. Don’t forget that we also had a 32 game unbeaten run in the league against Spurs home and away from that game until 2006 too. I’d suggest that never in top flight football in Europe has one team been unbeaten in 32 games – in consecutive seasons to boot – against another team. Those were heady days, no doubt. But the rare defeats against Spurs are even more awful because of our ridiculous ascendency in the past 22 years. The League Cup Final in 2008 was one of my worst days as a Chelsea fan; thinking about it, probably worse than the 2002 F.A. Cup Final against Arsenal. Such is my fascination with football in my childhood, it is quite likely that I can name most of that Spurs team from October 1974, but I sometimes struggle to name many of our opponents in 2012. That Spurs team? Off the top of my head…Pat Jennings, Phil Beal, Mike England, Jimmy Neighbour, Martin Chivers, Steve Perryman, Martin Peters, maybe Chris Jones, maybe Joe Kinnear. Infamously, the return game at White Hart Lane in the second-from-last game of the 1974-1975 season virtually condemned Chelsea to the old second division. We lost 2-0 and the hooligans were centre-stage again. Lord Parky was collected at just before 9am and it was clear that the day was shaping up to be the brightest and warmest of the year thus far. A day for polo shirts, no doubt. I had to pick up Steve, from Bournemouth, at Amesbury and so I had to double-back on myself to an extent. As Parky and I zoomed over Salisbury Plain, Parky put one of his own drum and bass mixes on the CD player. The music boomed out and it there was a super start to the morning. We drove past Stonehenge and Steve was collected at 9.45am. A little traffic held us up, but we were in The Goose just after 11.30am. We only had time for two pints of Peroni. I hate having to endure a rushed pre-match to be honest. Eliot from the New York Blues was over for the one game and it was great to see him again. The trip back to the UK was a sad one for him as his grandfather passed away recently. Once he knew that he was returning for the Spurs game, he sounded me out for a ticket; I didn’t hold out much of a chance to be honest. Unbelievably, he had been able to get hold of three tickets for the game via general sale…yes, that is correct; general sale. Arguably our second biggest game of the season and the tickets go on general sale. Eliot and I had a good little chat and moan about all things Chelsea. We covered quite a few topics in a short amount of time. Top work! Parky was flitting around and I saw Jesus briefly; he is off to Portugal on Monday, for three days of sun and Champions League football. As I have no holiday left, I will be missing out on the trip to Benfica. I can say it now; I told Jesus I was jealous of him. That boy is certainly packing everything in to his time in Europe. He has thrown himself into supporting Chelsea while on these shores with a ferocity that brings a massive smile to my face and gives me a warm glow inside. On the quick walk down to The Bridge, I spotted the first tourist wearing a Chelsea / Tottenham “half-and-half” scarf. I scowled as I brushed past him. It made me conjure up a quick little list of personal pet peeves with the Chelsea match day experience in 2012. 1. Friendship Scarves; come back when you have decided which team to support, idiots. 2. “Chelsea Till I Die”; this isn’t a Chelsea song, never was a Chelsea song, never will be a Chelsea song. Typically, it gets sung by Football League teams and that’s where it should stay. 3. Replica shirts being worn over long-sleeved shirts; did your mother dress you? 4. Noise; the atmosphere gets worse each season. I’m sick to death of being one of only three or four in a section of two-hundred who sings throughout the game. 5. “You never won fcuk all”; the double-negative messes up the intended message. I blame the parents. 6. The West Upper; even if we provided song sheets, I suspect you lot couldn’t be bothered to sing. 7. Chelsea Pensioners; the club has shunted their seats further away from the middle of the East Stand with each passing year. Give them a prime seat bang on the half-way line. 8. The nerd like fascination by some fans with Chelsea club doctor Eva Carneiro; have these people never seen a woman before? 9. What a load of clap; if we get a throw-in or a corner, don’t just sit there with your arms folded, acting cool; clap. It’s really easy to do. 10. Boo boys; don’t do it. It’s not big, it’s not clever. Support the players or fcuk off. 11. 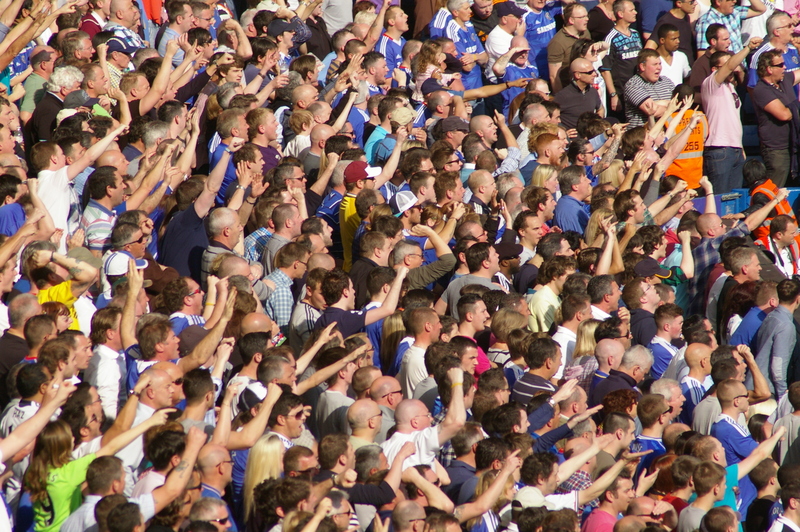 The “Chelsea – hooligans” chant; grow up. 12. Roman – after nine years, I’d really like to hear you speak. Hear your thoughts. Explain what Chelsea means to you. I made it inside with a few minutes to spare…up the six flights of stairs and up to the upper tier bar area…then inside. Spurs, of course, had three thousand in the south-east corner. Only two flags, though. At the start of the game, quite a large central section of away seats were empty. I guess these were the Tottenham corporates. God, what a bunch they must be. The game was a strange one really. The first-half was played out in great periods of hushed quiet. I had to pinch myself that this was a Chelsea vs. Tottenham game. In a way, we were surprised to see David Luiz on the bench, but there can be no doubts that Gary Cahill gave a polished and resolute performance alongside John Terry at the heart of the defence. Didier started and I have a feeling Fernando will start in Lisbon; hopefully able to exploit the space on the inevitable counter-attacks. The sky was devoid of clouds. It was a gorgeous day in SW6. “Chelsea weather” said Alan. After five minutes, a ball from Daniel Sturridge found a completely unmarked Didier Drogba – in tons of space – but he got tangled up with Frank Lampard and the chance was gone. The Chelsea midfield were struggling to impose themselves and Studge was having a very quiet game indeed. Tottenham were flooding the midfield but it took until the 30th minute for their first real shot on goal when Gareth Bale shot over. Soon after, Adebayor had an unhindered run down the left in front of me but tamely shot wide. Our chances were rare. There was a penalty appeal when Frank tumbled. We lost count of the times Bosingwa was exposed or out of position. However, Spurs were doubling up on him and our midfield players were not covering. The first-half came to a close with a ridiculous flurry inside the Chelsea six yard box. We seemed to go to sleep and Modric drifted through and set up a chance for Rafael Van der Vaart, but Petr Cech made a miraculous block, followed up by two other attempts, but Spurs only won a corner. The first real chance of the second half was an old-style route one attack; a Cech punt, a Drogba pass to a raiding Studge, but his shot flashed wide of Brad Friedel’s upright. This shot seemed to warm up the home fans and The Bridge eventually stirred with a few minutes of the “Chelsea / Amazing Grace” chant. Spurs responded with a shot from Luke Walker which hit the side netting. On 58 minutes, the most skilful moment of the entire game; the way Juan Mata killed a ball from a punt from Bosingwa, stopping it dead with his foot, was pure art. Unfortunately, the ball fell behind him and the chance was spurned. Frank Lampard, to be fair had lofted a superb chipped pass in the first-half, but the game was one of industry and toil rather than of skill and touch. David Luiz replaced Jose Bosingwa and then provided us with a typical Luiz performance; strong tackles one minute, terrible positioning next. We had a penalty appeal refused and the place was at last noisy. A free-kick from Juan Mata hit the base of a post and the ball ricocheted back towards Luiz but his prod took the ball away from the waiting Drogba. There were rueful looks when nemesis Louis Saha came on in place of Van der Vaart. Soon after, a horrendous moment and I thought that our unbeaten run was coming to an end. A Modric pass found Adebayor and he raced past an advancing Cech. Thankfully, his heavy touch forced him a few yards wide and these extra split seconds cost Spurs dearly. A shot on goal was miraculously cleared off the line by Gary Cahill. We were dumbfounded. It was exceptional play. Gary’s subsequent roar at the Chelsea fans in the Shed Lower was Terry-esque in its intensity. From the resultant corner, Spurs again went close when a Bale header crashed against the bar. Torres was now on, toiling on the right in place of the poor Sturridge. With a minute to go, another great ball from the otherwise average Lampard found Didier, but his delicate chip was over. In the last minute, a finger-nail chewing moment; a Tottenham free-kick was drilled in, but Cech flew himself to his left to scramble the ball for a corner. We withstood that last threat and the whistle blew. It was the first 0-0 result between Chelsea and Spurs in the league at The Bridge since the infamous “parking the bus” game in September 2004. The mood was quite sombre on the walk down Fulham Road. Points dropped; yes. Five points behind Spurs; yes. Only eight games left in the league to pass Spurs; yes. The Europa League beckons; yes. After seven Chelsea games in twenty-one games for Lord Porky and me, we are taking a rest next week. No game on Tuesday, but we will meet up for the jaunt to Aston Villa next Saturday. Who knows, Spurs might be out of the F.A. Cup by then. This entry was posted in Season 2011-2012. and tagged 1974-1975, 2011-2012, Hooliganism, Roman Abramovich, Tottenham Hotspur by Chris Axon. Bookmark the permalink.